FlowTech's Turbo Style Raptor Muffler is a real predator for performance and fuel economy, but treads softly on your wallet! Large internal flow tubes and functional sound ribs will have your car roaring, while offering additional strength over standard wrapped style mufflers. The double wrapped all aluminized muffler uses offset rolled seals for durability at an economical price. The Raptors are Sold Individually and feature a 4.5'' High X 10'' Wide X 13'' Long case. 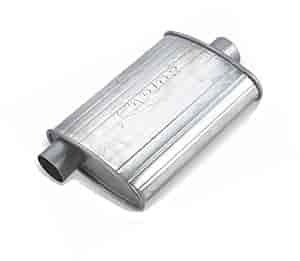 50051 - Flowtech Raptor Turbo Muffler is rated 4.5 out of 5 by 2. Rated 5 out of 5 by Jbott from Great for the price 350, headers, 2 1/4 out the back slight rumble at idle , sound sweet under acceleration .